The most common opposites were studied in depth, while having fun at the same time! The children are also studying the days of the week and months of the year. We are associating seasons with weather and discussing types of clothing for specific weather condiditons. Starting next week because of the Holidays, Peter and Jane will travel, and our EAC children will pretend to travel along! They will learn what it takes to travel. EAC Junior Level students have already choosen their favorite seasons and favorite activities. Now, they will choose a place to travel to. It promises to be fun! Colors and numbers continue to be the focus. 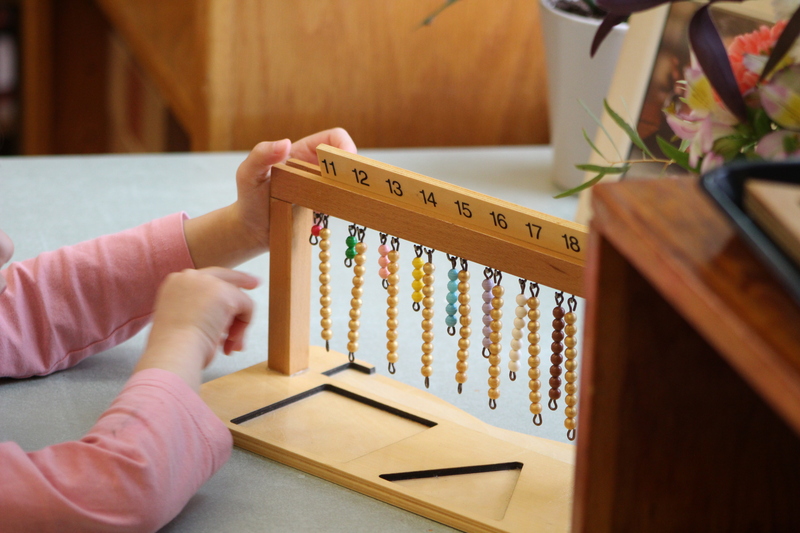 We worked extensively on number and color recognition using Montessori materials, followed by variations and extensions including hands on activities. Wednesdays are dedicated to reading. Students are introduced to objects and general vocabulary related to a book and then listen to the story while the teacher uses different tones of voice and movements to help them understanding the meaning of what is being read. I am happy to say that the children understand the stories really well! Students are learning vocabulary to describe themselves and the world around them through different materials and games. For Years 1 and 2 we are using “Conversa Conmigo”, a book that presents simple grammar structures to facilitate spoken communication. The focus is on verbs, the “heart” of a sentence to help students understand the structure of the language. Third Year Upper Level is reading texts and educational comic strips featuring speech in real life situations. Like the First and Second Year students, they learn how to talk about themselves, describing physical appearances and their likes and dislikes in more depth. We are constantly practicing vocabulary that has been introduced in the past such as weather, days of the week, months and classroom objects. If vocabulary is not used on a regular basis, it’s difficult to readily access in conversation. All students learned about the “El Día de los Muertos”, celebrated between Oct 30th and Nov 2nd in many of the Latin American countries. This celebration is fascinating for all of them, as it entails a rich cultural background with “calaveras de azúcar” (sugar skulls), “esqueletos” (skeletons), music and fiestas in the cemeteries. We used books to learn more about the history and customs of the holiday and watched a short movie in Spanish describing how the day is celebrated in Mexico. Students are co ntinuing to build up vocabulary and grammar structures with a variety of online tools. Past tenses have been introduced for Second Year Students and will be introduced shortly for First Years as they are crucial in any real life conversation. To practice past tenses in context, we studied the legend of the scarecrow: “La leyenda del Espantapájaros”, which was made into an award winning animation. The clip with audio provided language in context and with its dark mood was perfect to set the stage for the “Día de los Muertos”. We explored the origins of the holiday and talked about the similarities and differences of the “Día de los Muertos” between Mexico and Ecuador. In Ecuador the holiday is celebrated with a special sweet bread called “pan de guaguas” and a beverage called “colada morada” (literally strained purple), which we prepared together in a “Spanish only” mini-immersion environment in the Middle School kitchen. Classes are now almost exclusively in Spanish and students are embracing the challenge. Classes have created wonderful artworks over the first, few weeks of school by exploring pencil, using colored pencil, glue, and framing their artworks. The Bears started off the year with exercises excerpted from “Drawing with Children,” an excellent book that forms a good basic system to build many later projects. They have been making lines. Straight lines, angle lines, curved lines, and dots…all the “Five Basic Elements of Shape.” And…they have created improvisational works using the bins of colored line with pens, pencils, and markers. The Tigers are off to a good start with a still life drawing. The have shown real skill and concentration drawing the many parts of the teapot, abacus, and flower arrangements. The Lions began with a drawing of multiple birds, and progressed to imaginary animals…full of texture. Since the beginning of school Extended Day has created some remarkable things. You may have seen them. The map of the world, for example for UN Day. This was not a small map. In fact, it was as big as two montessori blue rugs. East and West. The United States and the Whole World in color. On UN Day the entire community located a place that they identified their origins on it and placed a namesake. We also made paper masks in color using the textures that the Junior Level had and with lots of primal colors. We marched them through the school in an impromptou exhibit. Last week they completed the big teepee covered with the many designs of North American First Peoples -home, hogan, friendship, the weather, the animals, and others. It took four great skins (sheets) to cover the entire teepee. They have also crafted amulets from clay from the same symbols. By the time they had finshed most of them knew the name of each one and could craft it. First Year Upper Level students have drawn large still life arrangements from observation. They are using watercolors to paint them. There is so much to be learned with this assignment – from perspective to complementary colors and how to mix paint. Most importantly, the students are learning to LOOK very closely and observe the world around them. Second Year Upper Level students are doing jewel-like drawings on scratchboard. The subject theme is underwater, but the main lesson is the use of line. With just white lines on a black background, line can be used to show three dimensions, shadowing, patterns and textures. Third Year Upper Level students are carving in soapstone. From chunks of rock, the students are uncovering beautiful shapes. They are learning the use of basic tools and, most importantly, they are learning to persevere. The work is slow and demanding. Middle School students have each designed a personal stained glass composition and are moving through the stages of choosing and cutting glass, grinding it to fit properly, applying copper foil and then soldering the pieces together. They are all doing amazing work! Students have each designed a personal stained glass composition and are moving through the stages of choosing and cutting glass, grinding it to fit properly, applying copper foil and then soldering the pieces together. They are all doing amazing work! The positive energy in PE classes has been contagious this fall as each class learns to cooperate and participate in an active, peaceful and safe environment. We love our new gymnasium: what a wonderful space with so many opportunities! Curriculum focus thus far has been on conditioning the students to jog/run for extended periods of time. The students have been challenged to do their personal best in their fall semester distance run. They will be challenged to improve on this marker during the spring distance run. I encourage your support from home to help promote a fit and active lifestyle. A family that finds ways to exercise together creates a foundation for their children to build upon as they grow into adults. I ask you to share your love of movement by requesting your child to show you how far and long they can run! Sports and competition, even tag games, can sometimes bring out difficult aspects of our children’s personalities! In order to create a cooperative environment, I teach in a way that takes the emphasis off of winning. The students are lead through activities that encourage exertion, with fun and safety as the focus. My goal is to teach each child the love of movement versus the love of winning. If your child participates in extracurricular athletics, this may be a very different message than what they are used to. Having a conversation about this may help them understand the importance of fair play.